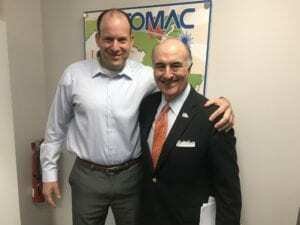 Potomac is honored that just in time for the 2018 Manufacturing Day, Maryland Secretary of Commerce Mike Gill visited our Baltimore County facility for a tour of our advanced manufacturing facility. As the state’s primary economic development agency, the Maryland Department of Commerce stimulates private investment and creates jobs by attracting new businesses, encouraging the expansion and retention of existing companies, and providing workforce training and financial assistance to Maryland companies. It is an important government agency that fosters public-private partnerships to build a strong future for our citizens, especially our young people. Secretary Mike Gill is uniquely qualified to lead the agency since in addition to his role as a public servant, he is also an accomplished business leader with four decades of experience as an entrepreneur, a technology executive, and an investment banker. He clearly understands what it takes to start, grow and sustain a business, allowing him to guide the most effective programs for Maryland businesses. Advanced manufacturing is especially important to the people of Maryland. Recent studies in Baltimore have shown that jobs utilizing Science-Technology-Engineering-Math or STEM skills provide as much as 63% higher wages than jobs with similar levels of education. Operators and technicians with 2-year degrees or less are the backbone of our contract manufacturing capabilities including 3D Printing, laser cutting and welding, CNC machining and CAD design. Combined with our engineers and quality control experts, the Potomac staff on a daily basis manufactures parts for the medical device, biotech, microelectronics, and consumer products industries. In addition, Potomac’s diverse capabilities allow us to fabricate fully integrated Microfluidics devices for a wide range of industries.